Does the Demotix citizen journalism agency offer a model for the future or will it simply undercut the professionals? Love them or hate them, Demotix has made its mark on the industry. Our networking party tonight offers the opportunity to meet Demotix CEO Turi Munthe and hear about their work as well as network and enjoy some complimentary drinks. 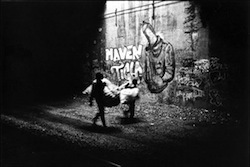 Tomorrow we have Dutch photographer Teun Voeten who will be discussing his insightful photography project which documents the lives of people living under Manhattan in its network of tunnels. Next week at the Club we have two events which we hope will help throw light on key issues in the wake of tomorrow’s spending review: Who better to discuss the current economic crisis than BBC Newsnight economics editor Paul Mason and playwright David Hare, both of whom have explored in different ways the 2008 banking crisis and its causes. Then we have a panel discusssion that will focus on the international development budget and the planned changes to be made by the coalition government.